India, where the Sholayar ranges start. The 80 feet drop, mighty waterfall in the forest region encompassing the exotic wildlife and the natural greenery that adds beauty to it which surely will leave you spellbound. 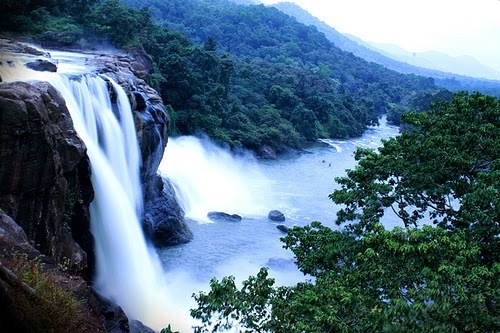 Athirappilly is one of the most exotic locales in Kerala surrounded by rivers and forests. It is also considered as one of the hottest picnic spots. Nature lovers will thrive on its beauty and scenic views, as there are very few places like this that brings you close to nature and leaves you thrilled throughout your journey. The waterfall is simply exotic and mysterious that keeps you wondering about the beauty of nature. It also houses some of the most endangered species and plants. In fact, it is believed that this region is the only place where four endangered Hornbill species can be found, which is one of the primary reasons why, the International Bird Association have announced it as an ‘Important Bird Area'. This place not only lightens your spirit but it rejuvenates you thoroughly from within. The best time to visit Athirappilly is during the monsoon season. This time is when the waterfall looks even more beautiful and the rain naturally refreshes the region making it more pure and delightful. The water falls: Athirapilly falls, Charpa falls and Vazhachal falls. Water theme parks: Dream world waterpark, Silver storm Water Park. Dams: Thumpurmuzhi, Peringalkuthu and Sholayar Dams. Athirappilly connects you to nature and rejuvenates your mind and soul. This place is indeed the best weekend getaway from the hustle and bustle of big city life. A place, which is most definitely worth visiting.